Last weekend, my son turned 5. Just saying that sentence makes me pause. Five years ago, my life was changed forever and into it, entered this incredible gem of a boy. From day one, he set my world on fire with his big eyes, ginger hair, and wild personality. Every day has been an adventure with him and I thank my lucky stars that he chose me to be his Mama. How cool is this Darth Vader humidifier from Giant Tiger? I love the detailing and incredible quality of the Pottery Barn Kids bedding. 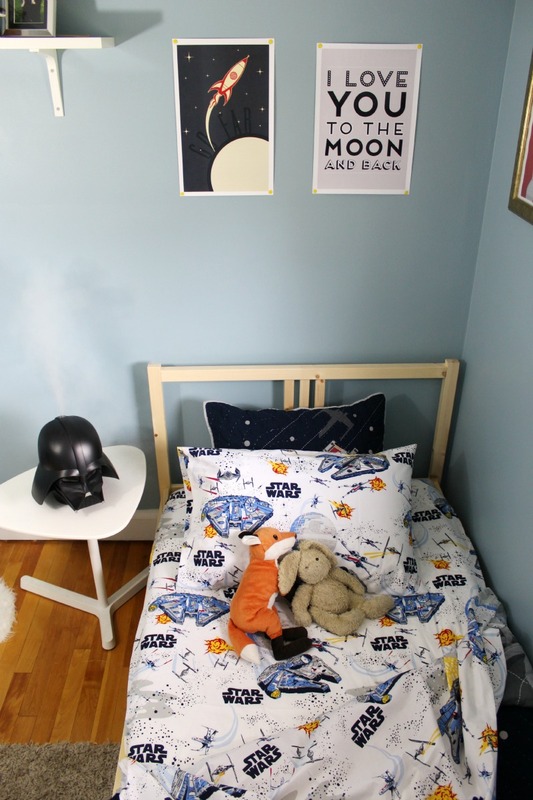 The Star Wars™ Millennium Falcon™ Quilt from Pottery Barn Kids is the focal point in Aiden’s room. When you come into his bedroom, his bed looks so inviting and cozy with the pure cotton quilt and plush pillows. 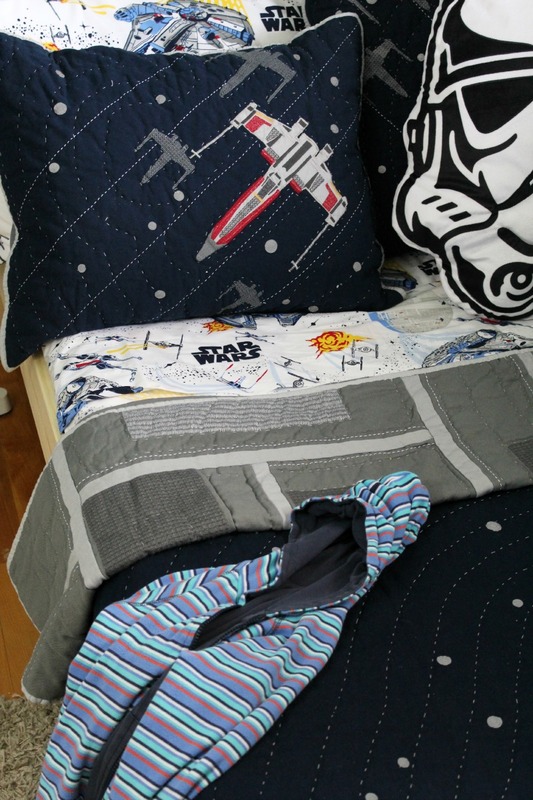 The intergalactic design featuring the Millennium Falcon™ flanked by X-wing™ fighters is iconic Star Wars style all the way! 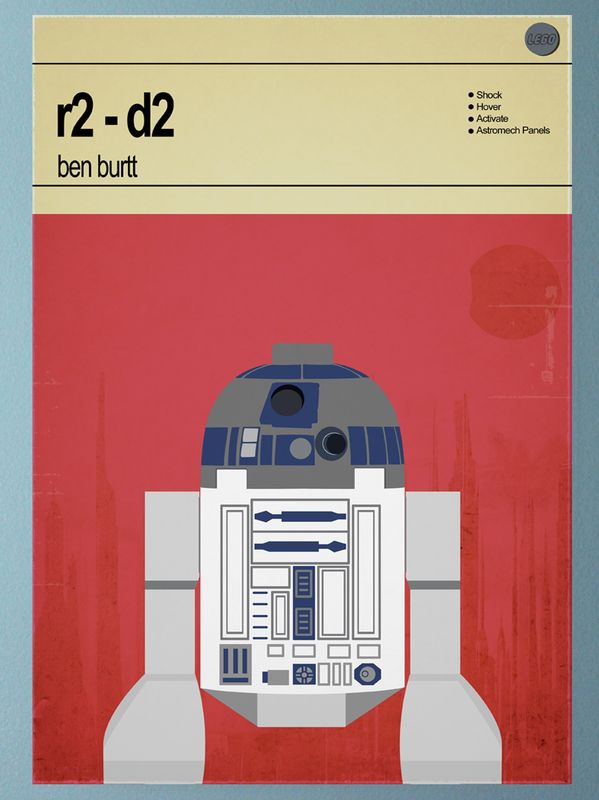 Here’s a close up of the detail on Aiden’s r2-d2 print from House of Print Shop. He went crazy over it from the minute he saw it! We started a craft gallery where Aiden can pin his crafts that he comes home with daily. I love getting to see his art up on display and he loves showing off what he created. 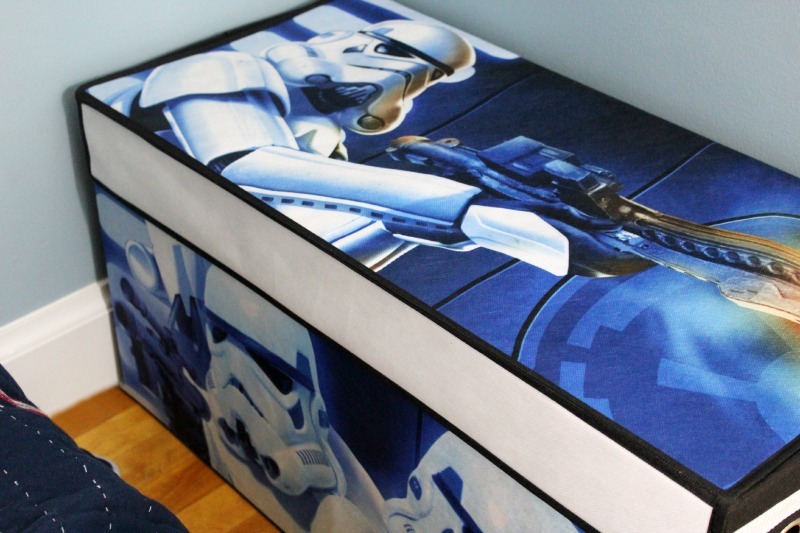 This Star Wars toy chest is so great for all of Aiden’s action figures! We put them to “bed” at night and they are nicely stored and cleaned up off the floor in their own home. 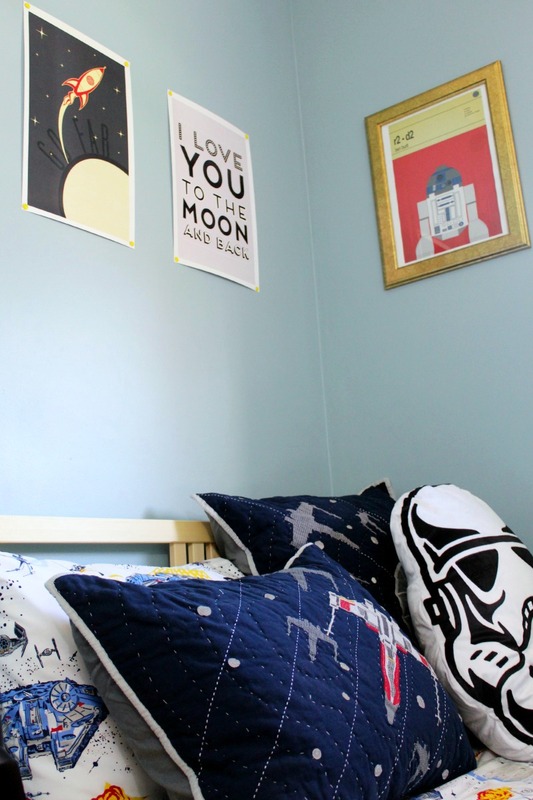 I wanted to add some powerful messages in Aiden’s room and I loved how this print from Dime Store Saint Design tied into our theme and inspires greatness! 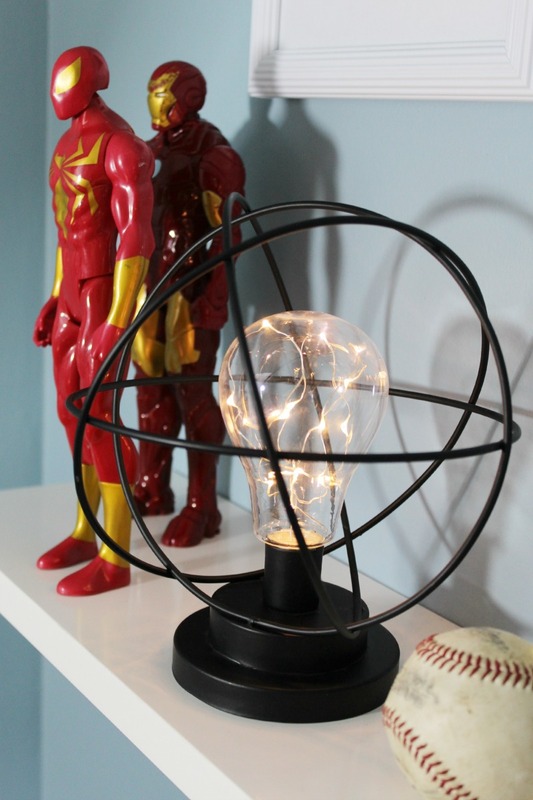 This lamp from Giant Tiger is a BIG hit! Not only does it look awesome, it’s lightweight, has a plastic bulb, operates on batteries and doubles as a very cool night-light. We wanted to create a reading space for Aiden that wasn’t his bed, so he didn’t feel like reading a book meant bedtime already. 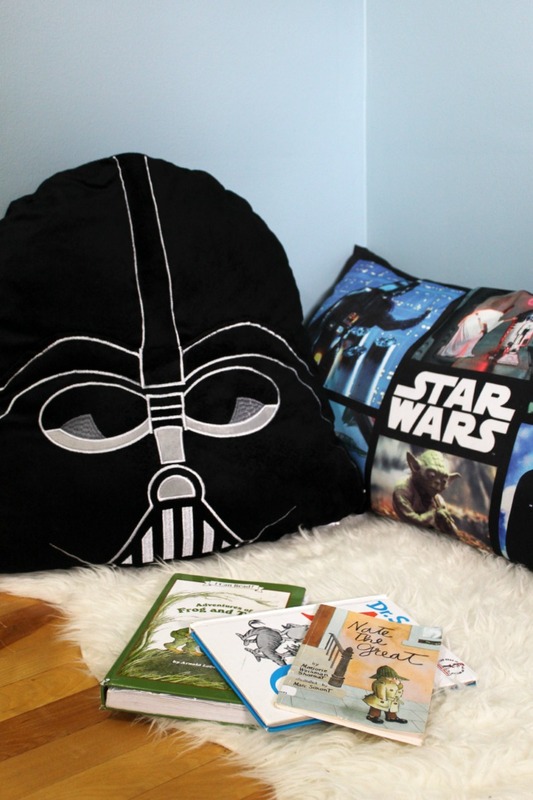 Now I find him resting on one of the large body pillows after school just flipping through his books and enjoying some quiet time in his new room. 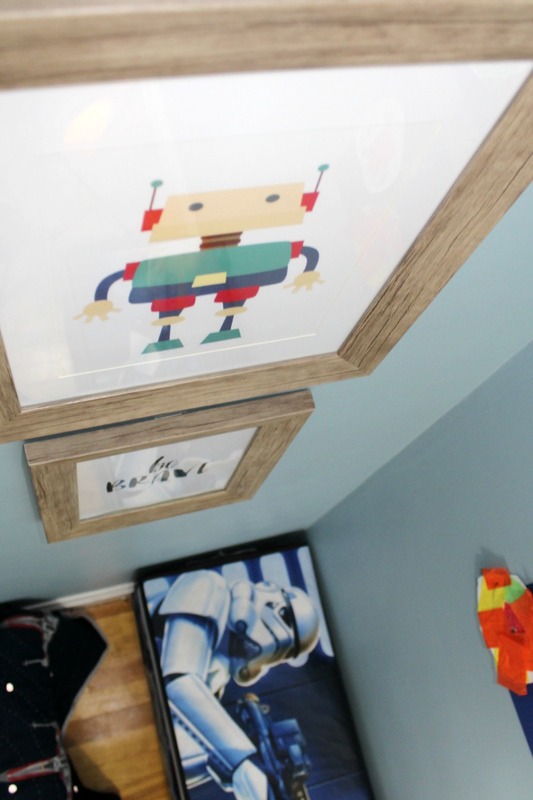 I love this retro robot print from Kali Laine Designs, it has a playfulness about it. 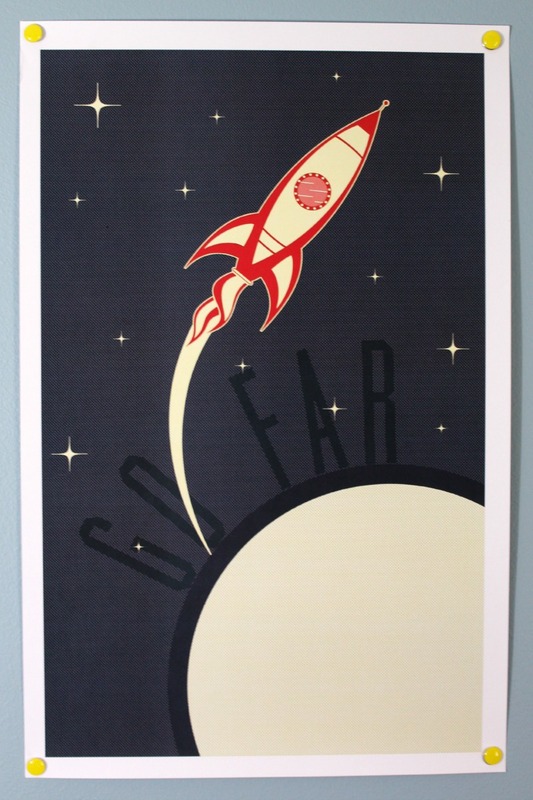 Beneath it is Domestically Curated’s print “Be Brave”, which I adore. 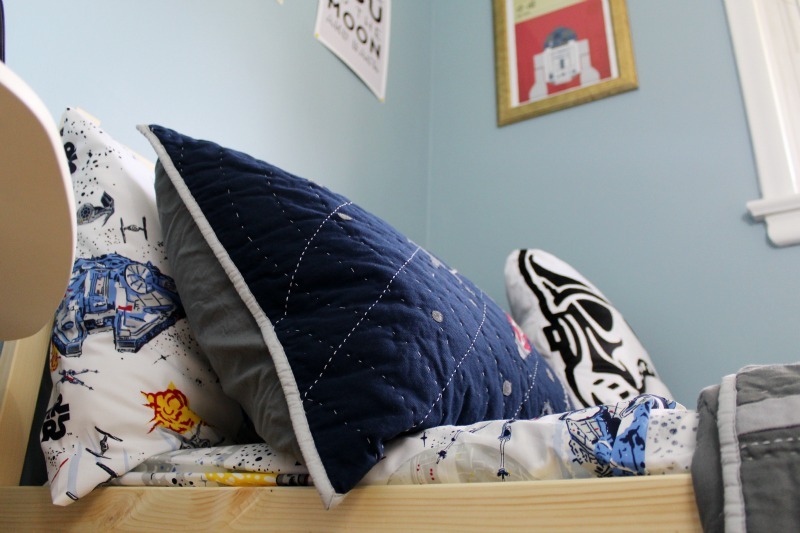 You can see the stunning detail on the quilt and sham from Pottery Barn Kids. You can see cool steam coming from the Darth Vader humidifier which Aiden thinks is very neat – and I like it because it’s beneficial to combat dry air and coughing all winter long. 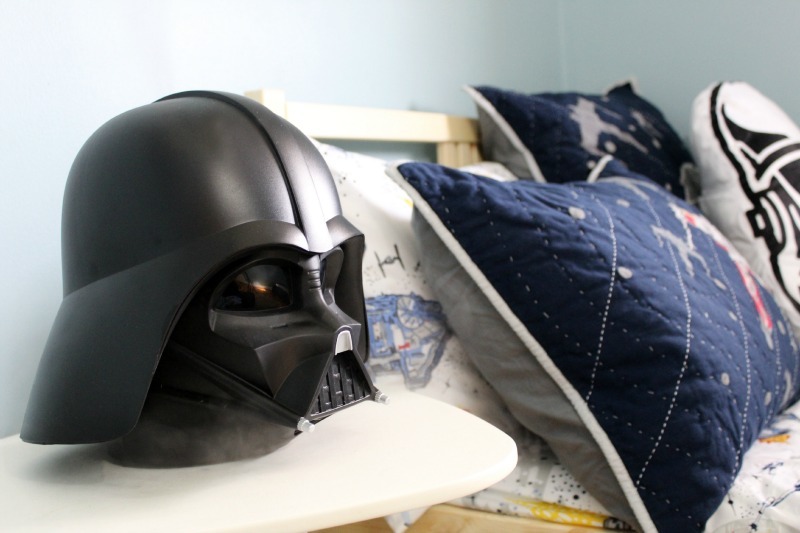 The Darth Vader humidifier from Giant Tiger is such a cool feature in his room. Who would have thought a humidifier could be so much fun? Kids and adults are quick to comment on how impressive it is. 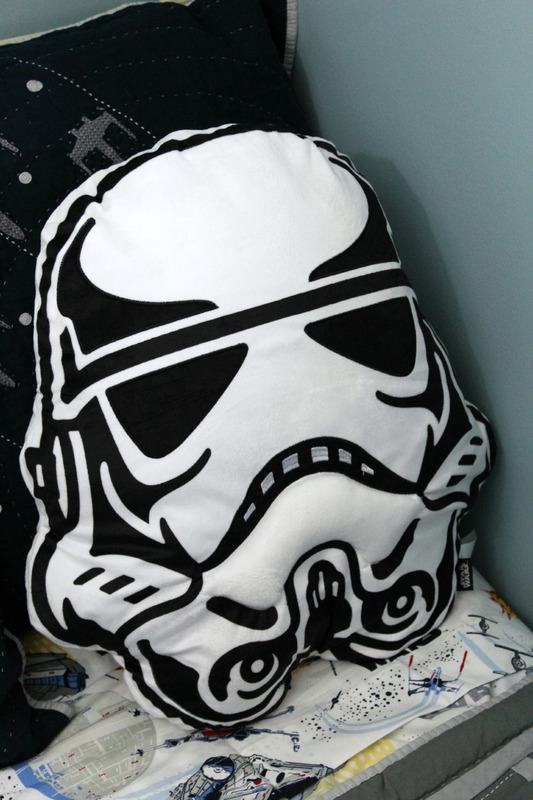 These large character pillows from Giant Tiger as playful and comfortable! 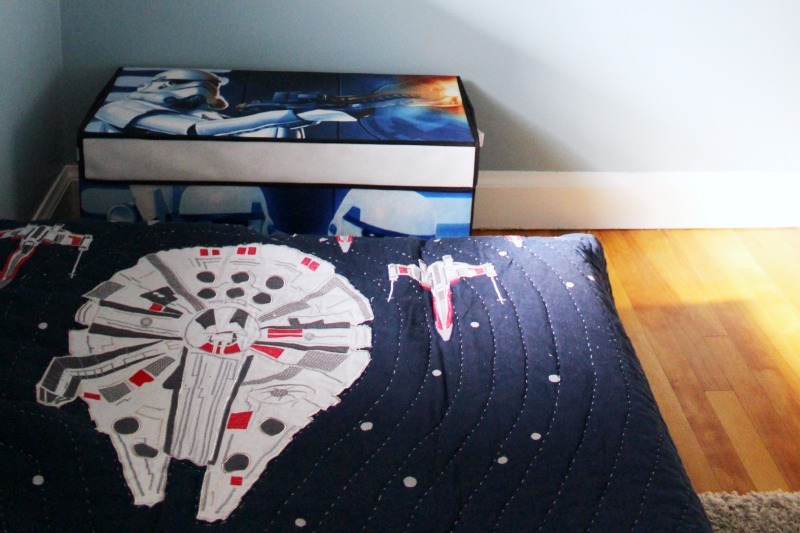 A closer look at the starship on Aiden’s new bedding. 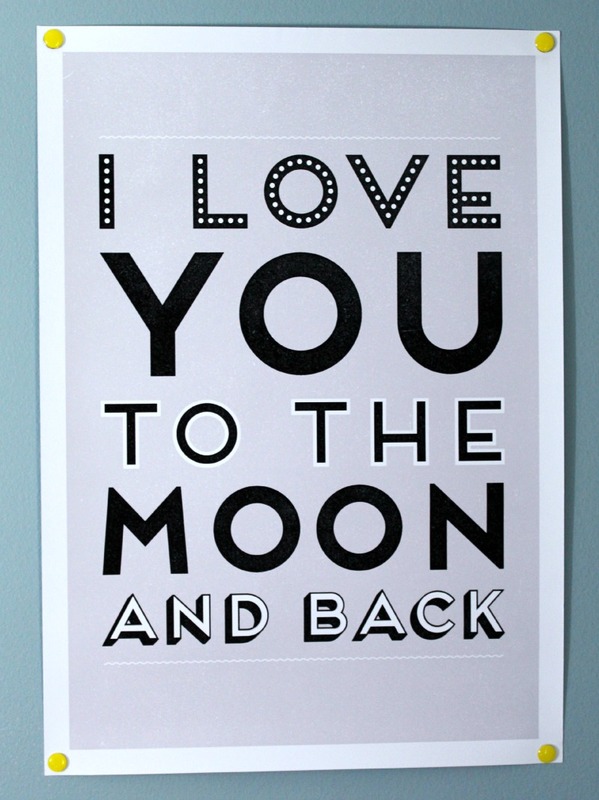 One of our favourite sayings found the perfect place on his wall. That’s the face of sheer surprise! He loves everything about his new bedroom! 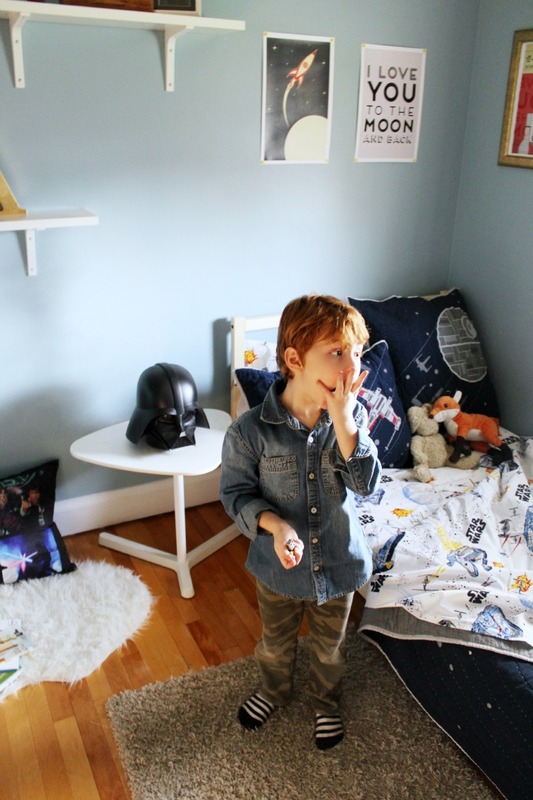 It’s so hard to choose a favourite item in his room, because I love the WHOLE look! Does something catch your eye? Many of the pieces from Giant Tiger will be available at select stores mid-November. For all the other featured pieces, you can click-through to order them directly online. A special thank you to the brands who contributed to this amazing room. 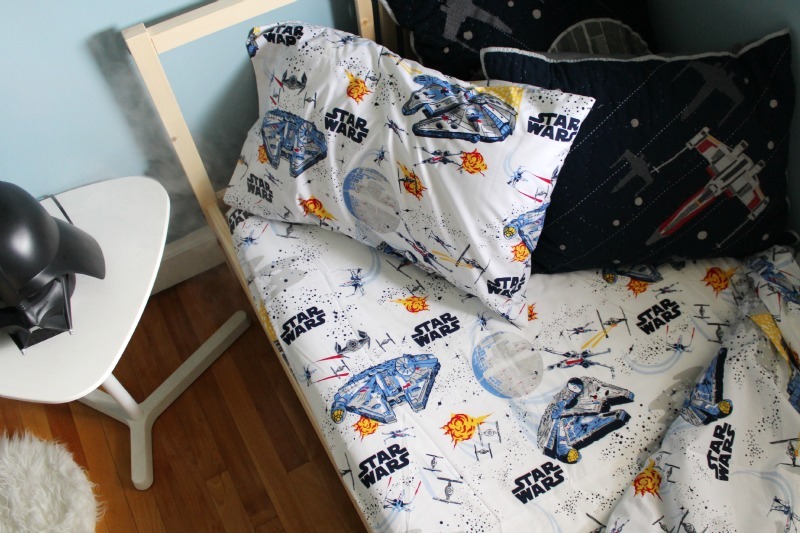 I hope you are inspired to create an intergalactic space for your Star Wars fans too! Love the new decor. What a lucky guy. Thanks Jessica! He loves it and has a blast playing in his new room. This is such a fun and fanciful room for your little ! The bedding is really inviting and fun, and the toy trunk is amazing! The Darth Vader humidifier made me giggle as I thought it was a clever idea as well. Who would not want that piece in their room? Congrats to your son on his new journey as a big boy! Hello! Your little guys room looks amazing!! 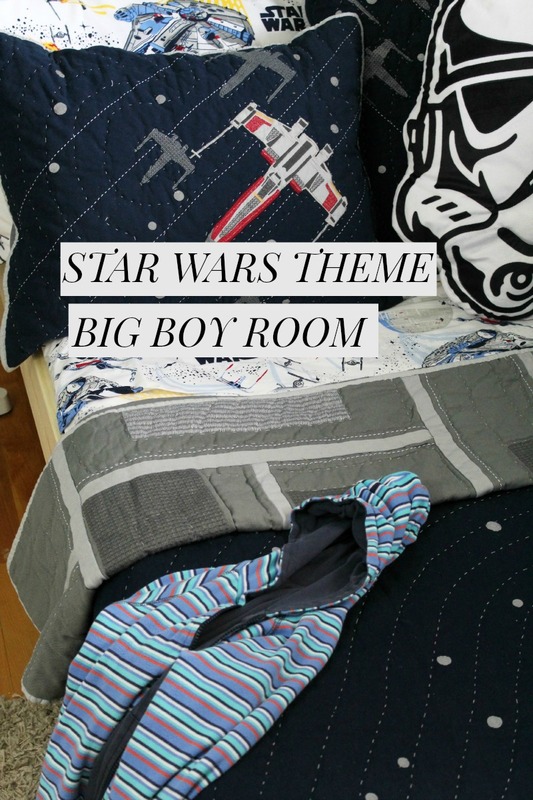 My husband and i are trying to remodel our sons room to star wars as well! My husband looved the storm trooper toy box but im having truoble finding it through the link provided in this article:( Is there anyway you could help us out with this??? Thanks so much!!! Hi Kimberly, thank you so much! I’m glad that you like the design inspiration. They never sold the toy trunk online (found it in stores) – so the link was just a reference to the merchant. If you have a Giant Tiger in your city, you could visit to see if they have any in-store. The other retailers that I’ve seen Star Wars trunks are like this are Target & Wal-Mart. They are pop up style, and usually range from $19.99-$39.99 Sorry I couldn’t be more helpful! 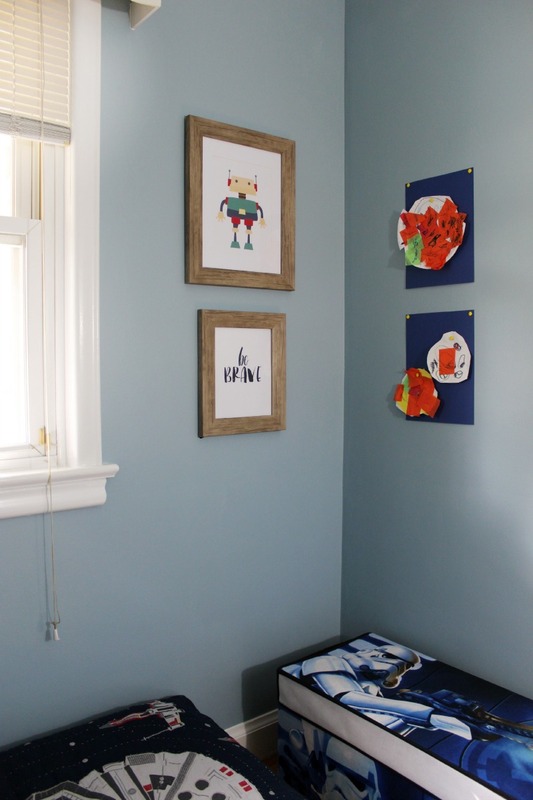 I would love to see pictures of your son’s room once you update, so be sure to tweet me @bestofthislife or tag me on IG @best_ofthislife I’m sure he’ll love it!